When someone is allergic to cats, the most common advice given by physicians is to get rid of the cat. Allergies are also one of the top five reasons why cats are returned to shelters. However, according to the American Academy of Allergy, Asthma and Immunology, nearly 10 million people choose to share their homes with cats and dogs despite being allergic. Contrary to what most people believe, cat allergies are not caused by cat hair, but by a protein found in a cat’s saliva, urine and dander (dried flakes of skin). How could one tiny little protein cause the wheezing, sneezing, runny eyes, hives, asthma and even breathing problems that some people experience when they’re around cats? People with allergies have oversensitive immune systems that mistake harmless things like cat dander for dangerous invaders, and mount the same response as they would against bacteria or viruses. The symptoms of the allergy are the side effects of the body’s battle against the perceived threat. Even though you may never be able to get rid of your allergy symptoms, you don’t have to give up your cat. There are a lot of things you can do to help you cope with allergy symptoms and still enjoy the love and companionship of your cat. There may also be hope in the form of a vaccine for allergy sufferers. Science Daily reports that researchers have developed a vaccine that successfully treats people with an allergy to cats. The vaccine, developed by immunologist Mark Larché, professor in the Department of Medicine in the Michael G. DeGroote School of Medicine and Canada Research Chair in Allergy & Immune Tolerance, is said to be effective and safe with no side effects. Read the entire report about the vaccine on Science Daily’s website. Are you living with cat allergies and cats? What has helped you? Excellent post. I’m mildly allergic to my cats, but have developed immunity to them (though I still get allergic to other people’s cats sometimes.) I am successfully following many of your tips – I have tile floors which are swept and mopped weekly, animal bedding is laundered weekly, and the cats are not allowed in the bedroom. I’ve also had success with some of the anti-allergen sprays available (spraying on upholstery.) Haven’t tried the pillow covers idea yet, but that will be next! It *is* possible to live with cats and allergies! It just takes a little bit more work is all. I spent most of my life allergic to cats and therefore hated them even though I would never hurt one. It wasn’t until I had a mini-stroke that they found a cyst in my sinus cavities that was reacting to cat dander. Controlling the cyst (can’t be removed) controlled the allergies and now i have two beautiful fur-buddies living with me, both rescues. Sometimes it takes severe turns in one’s life to find things otherwise missed. I know it’s odd to say you are grateful for something bad but the mini-stroke gave me a chance to enjoy something I never could before, a cat’s love. I’m sorry that it took a mini stroke for you to find out that you could live with cats, Rick, but I’m so glad you now get to experience the love of not just one, but two cats. I swear by my Neti-Pot, Jen. Even though I’m not allergic to cats, I do occasionally have an allergic reaction to something outside. A quick rinse with the Neti Pot removes the offender. I also haven’t had a cold in years, I regularly use my Neti Pot during cold and flu season. We don’t have any allergic people in my family, thankfully (we’re all cat lovers and cat parents! ), but thank you so much for all the precious advice… you never know! And it may come in handy when I hear people saying they have to get rid of a cat because their child/husband/wife/boyfriend is allergic! 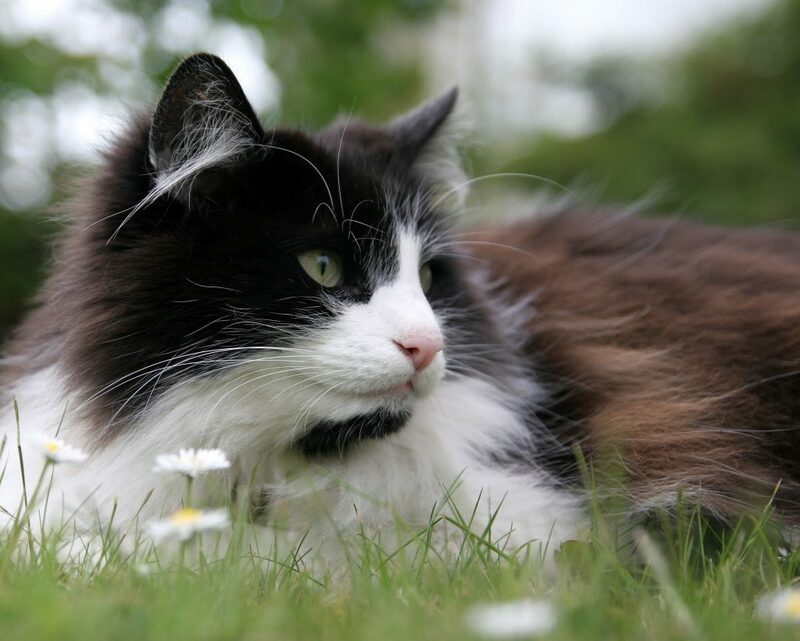 It’s great to read so many comments from your readers who have found ways to fight their allergies while living happily with their beloved cats! Yes, please pass this on to anyone who thinks that being allergic means having to give up your cat, Anna. I just found out that my son is allergic to both cats and dogs and that his asthma is most likely being caused by our cat who lives indoors with us. Our dog spends most of the day outside but spends a lot of time indoors with me too. The doctor didn’t tell me to get rid of the cat but he said he didn’t recommend having it in the house so I was quite upset. Now that I’ve read this article though it gives me hope. Thank you so much. I live in Japan and wonder if immunotherapy shots are available here. I will have to do some more research on the topic because I love animals and I want my children to love them too. I have asthma and am allergic to cats but I’ve been able to coexist with Montana in our home since we adopted him at nine weeks old. I’ve been doing immunotherapy (shots) and take an OTC recomended by my allergy/asthma doc and have no problems. I didn’t follow the advice of keeping him out of our bedroom because he’s slept with us since he was tiny and I’ve still been ok and since he’s an inside only cat we hate restricting him. I think the advice of keeping cats out of the bedroom is probably the most ignored advice by allergy sufferers, Montana. I couldn’t do it, either. I am allergic to cats and dogs. And I live with two cats and a dog. I take OTC allergy medicine, have a HEPA air filter and use a HEPA vaccuum when I have the time. I also try to brush all the animals regularly so the shedded fur can be contained. I think it’s been working pretty well, although I don’t find it intolerable to live with a bit of a runny nose all the time. I’d prefer to breathe clearly of course, but given the tradeoff, I’d much rather have my animals. I’m glad you found ways to manage your allergies, Rachel. I’ve used Homeopathy for years to successfully control my allergies. And you are very right that it is rarely just a cat allergy. My main offender is dust mites and tree/ragweed pollen. Cats were a very small part of the allergy equation. And the doctor had the nerve to tell me to “get rid” of my cats! I highly suggest finding a certified homeopath to work with as they can better determine the correct remedy for your specific needs. Homeopathy can be a very powerful remedy and I would definitely consider it for allergy relief. I agree that working with an experienced homeopath is the best way to go about it. thank you for this most informative post! I have read blogs in the past month where the writers had mentioned the possibility of having to give up their cat due to allergies and were wondering what to do. now I have your blog post to refer them to! Thanks, Caren. You have a wonderful day, too! I used to be very allergic to cats (hence why we never had them as pets) but my allergy is almost gone. I still get slightly sniffly and a scratchy throat, but no red itchy eyes, no wheezing, no sneezing! I am allergic to many outdoor plants and trees as well as dust mites and mold and some of that has been reduced as well. I had almost a year of allergy shots so perhaps that helped. I have a question. Cami had a yeast infection in her right ear and we got rid of that but then it started up in her left ear. Is this common in cats and what causes it? We’re currently treating it with antibiotic ointment but her ear is obviously sensitive and it’s a struggle getting the medicine where it needs to go, she shakes her head and squirms. Marty, yeast infections have a tendency to recur if the underlying problem isn’t addressed, which can be anything from medications to diet to allergies. I’d take Cami back to your vet if this isn’t clearing up. My human doesn’t have allergies to cats, but she does have allergies. We’re going to try the nettle and see if it helps. Thanks!!! Let us know if that works for your human, Rumpy.